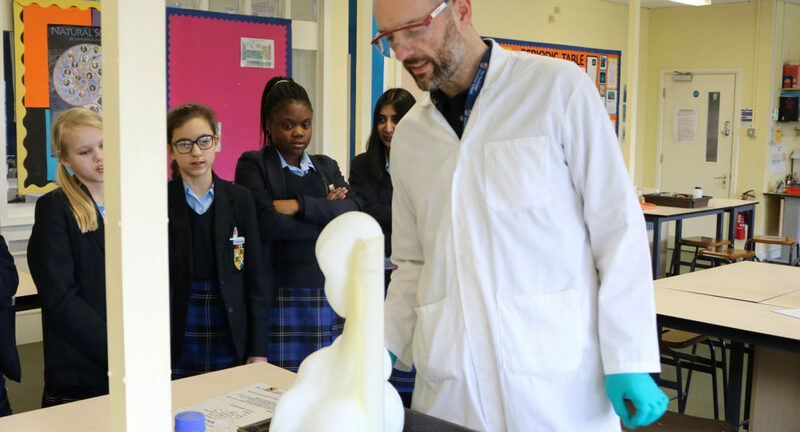 Rochester Grammar recently celebrated National Science Education Week (11 to 15 March). This year the theme of “journeys” was woven into a wide range of activities where students participated in houses competition to earn points towards the Golden Bunsen Burner Award. Key Stage 3 classes had special practical based lessons all during the week. The year 7 students designed and built a boat to test and see how much mass it could hold before sinking. They also had a great time making slime and building mini rockets were the had to calculate the right amount of reactant to have it launch after a set period of time. Year 8 classes designed and built bridges out of paper and wooden splints. They tested them to see how much mass they could hold before collapsing. DNA was extracted from strawberries and the journey of the discovery of the structure of DNA was explored. They also worked to created posters on the theme of “journeys” that will be sent to a national competition. Year 9 classes competed to design and build a windmill that could lift the most mass. They also participated in a careers-based activity called “People Like Me” that sought to link their personality traits to those needed in various STEM careers. Year 10 classes tried to build the tallest light house using only a limited set of resources. Students had to the chance to watch the film ‘Hidden Figures’ that shows how women were some of the critical workers that computed the numbers necessary to enabled humans to fly to space. Friday was the culmination of the festivities for Science Week. Students were able to see a vast array of amazing chemistry demonstrations whilst other participated in a contest to see who could remember the elements of the periodic table. Two students were able to memorise all 118, in order! The science teachers got into the spirit of the week by creatively dressing up in costumes related to the theme of “journeys”. Rochester also sent teams to the Rotary Club Technology Tournament held at the Royal Engineers’ Museum. They competed in all day STEM challenge against other local schools. Our Key Stage 3 and Key Stage 4 teams both one first place in their divisions.